Deciding upon building a home addition is a major endeavor and it is not for the faint of heart. This said many people choose the home addition route versus selling their existing home and moving to a larger one. Like any major project, planning is critical, and thus a home addition design is a must for a number of reasons, including obtaining accurate home addition estimates. How big to make your home addition? How much will your home addition design and home addition cost? What tools to use for creating a home addition design? How to find a reliable and qualified home remodeling general contractor? How to finance your home addition? Prior to kicking off home addition design plans it is important to understand why you need the extra living space so that you can design your own home addition plans accordingly. Thus you need to start off by generating a list of what you want/need in your future home addition and then developing a set of basic DIY home addition plans and a rough DIY home addition cost estimate, or budget, for the project. It is important to make sure your home addition won’t dwarf your home. In general your home addition should not represent more than about one third of the area of the entire house. Any bigger and the home addition will look out of proportion with the main house, particularly if you did not use an architect to develop the home addition design plans. A simple family room addition will cost your on average somewhere between $80 and 130 per square foot. If a bathroom or kitchen is part of your home addition design plans, expect for the home addition costs to be 25% to 50% higher on a cost per square foot. Learn more about estimating home addition costs here. If you hire an architect for generating the home addition design plans anticipate his/her fee to be between 5% and 10% of the total cost of the home addition construction project. 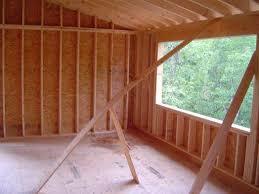 Again, the first step in developing your own home addition design plans is to determine why you need the extra space. Most homeowners elect to build a home addition because the family is growing and they don’t want to leave their community or spend more money on real estate closing costs. In other cases homeowners just want to build the custom master bedroom or family room home addition to make their home more comfortable. My Room Addition Bid Sheet, shown below, is the perfect tool for estimating home addition costs as well as helping you with knowing how to select the right remodeling contractor for your home addition design plans. Once you have mapped out what your home addition design needs are, begin to architect your home addition by sketching out some floor plans on graph paper. Ideally you should make the home addition design sketches to scale so that you can assess better if the home addition space will be the right size for your needs. After you’re reasonably satisfied with your home addition design plans you can then move on to the next phase in the design of your home addition. Invest in a home design software package that will transform your sketches into actual home addition plans that contractors and building inspectors can follow. Use one of this home remodeling checklists and save time and money on your home construction project. The company Chief Architect offers a software package called “Chief Architect Home Designer Suite 10” that is excellent and affordable for home addition designing. It provides all the cross sectional and elevation views and information a contractor would need to quote your home addition project. In addition it can help you to estimate the actual home addition costs. When transferring your sketches into the home designer software package pay close attention to how the home addition will tie into your existing home. It is important that the home addition is sized properly and melds into the existing home so that it is both aesthetically attractive from the outside curb and is functional from with inside the home. Once you’ve completed your own home addition design plans, and before you provide the plans to any contractors for bidding on, take them to your local building inspector to make sure your home addition meets all local building codes and zoning laws. There is no point of wasting yours and a contractor’s time on bidding on the project until the building inspector has confirmed that your home addition design is in compliance with all the municipality’s building codes. After you get the building inspector’s approval of your home addition design plans, submit your plans to a few home remodeling general contractors to get construction bids. Again, use my Room Addition Bid Sheet to help find and hire the right general contractor for your home addition project. Finally, after getting firm home addition cost estimates from your contractor determine how you will pay for your home addition. In most cases homeowners borrow money as well as pay for some of it in cash. In some cases it may make more sense to take out a home equity loan against your existing mortgage. In other cases, if interest rates are lower than you existing mortgage, it may make more sense to refinance the entire mortgage with the additional funds to build the home addition. If you have an existing mortgage speak to the bank to see if you can refinance the loan for the extra funds that are needed to build the home addition. Also discuss with them a construction style loan so that you can pay the contractor while the home addition construction is under way. The bank will want to see your home addition design plans, so make sure to bring them along with you when you visit your bank. 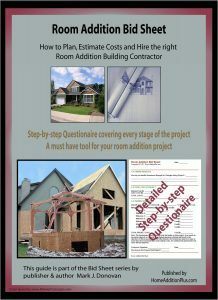 For more help on home addition designs and building a room addition, see HomeAdditionPlus.com’s Room Addition Bid sheet. The Room Addition Bid Sheet will help ensure that your room addition project goes smoothly and is completed on time and budget. Free Home Addition Design Price Quotes with No Obligation!